Why do Utah and the surrounding region need nuclear power? What are the considerations for water use? How does nuclear power affect the environment? What will be done with the spent fuel? Where is the Blue Castle site? Used fuel is only waste if it is not reprocessed or recycled; it contains important energy and industrial materials, as well as non-usable residues. Used reactor fuel is still very valuable. It has about 95% of its initial energy that can be reprocessed or recycled to generate more electricity in the future. For this very reason, it makes sense to utilize used fuel in a manner that will benefit the nation and protect public health and safety. 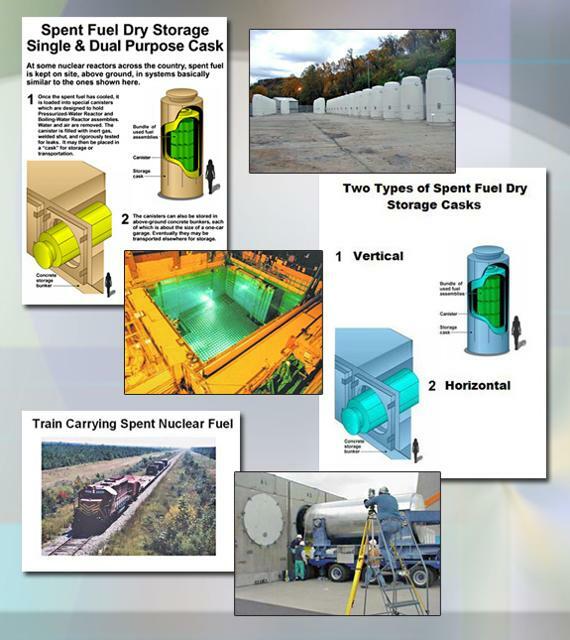 Exercising available options for utilizing the used fuel and permanently store the radioactive residues are prudent to the nation's energy future and environmental stewardship. There is no current scientific, economic, or safety rationale requiring the near term movement of spent fuel from the nuclear power plants where it is generated. This has been the case since the first commercial nuclear power plant began operation in 1957. The Nuclear Regulatory Commission has concluded that spent fuel is safe to store on site for 100 years or longer. Used nuclear fuel is contained in a very small volume of high density materials, consisting of ceramic uranium fuel pellets incased in metallic tubing. All the used nuclear fuel produced by the U.S. nuclear energy industry in nearly 50 years-if stacked end to end-would cover an area the size of a football field to a depth of less than 10 yards (Source: Nuclear Energy Institute). The Blue Castle Project will have spent fuel storage facilities able to provide over 100 years of safe and secure storage in the reactor building. Used or spent fuel can be stored on the Blue Castle site, or any other suitable site, in dry casks for very long periods of time. A 60 year batch of used fuel from a two-unit 1,600 megawatt nuclear power facility, like the Blue Castle Project, will fit on 1 ½ acres. At most nuclear reactors across the country, spent fuel is or will be kept on site, above ground, in systems basically similar to the ones shown here. Once the spent fuel has cooled in water-cooled fuel pools, it is loaded into special canisters. Each canister is designed to hold approximately two-six dozen spent fuel assemblies, depending on the type of assembly. Water and air are removed from the canister. The canister is filled with inert gas, and sealed (welded or bolted shut). Some canisters are designed to be placed vertically in robust above-ground concrete or steel structures. The graphic below provides examples pertaining to the storage of spent fuel at nuclear reactor sites. Eventually, after its radioactivity has significantly decayed during its estimated 100 years in storage, the spent fuel would be transported to be reprocessed or stored at an offsite facility. The transportation safety record of the nuclear industry is excellent. Past U.S. shipments of spent fuel have covered 1.7 million miles with no resulting injuries, fatalities or environmental damage. The nuclear industry is one of the safest industries in the world. It is a fact that the U.S. nuclear industry has accumulated almost 3,400 reactor years of operations without serious injury or death to a single member of the public, and that encompasses the period including the Three Mile Island nuclear accident (1979).